Huge Savings Item! Free Shipping Included! Save 15% on the Wireless Earbuds,Dveda Bluetooth 5.0 3D Stereo Sound True Wireless Headphones 90H Playtime and Noise Cancelling Stereo for iPhone and Android by DVEDA at DJ Luu. Hurry! Limited time offer. Offer valid only while supplies last. 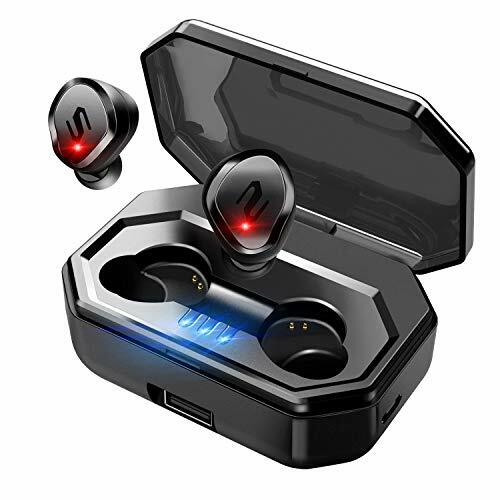 ★【Latest Bluetooth 5.0】Compared to other Bluetooth headphones with Bluetooth 4.1 or 4.2, these earbuds adopt Bluetooth 5.0.It produces extremely efficient wireless for a better connection and improved sound. And manages battery life so well, you can listen for 3-3.5 hours on a single charge. It's performance that's unheard of in a device this small. ★【Simple one-tap setup】Liberates you from the complicated pairing. Just take them out and they're ready to use with all your devices. Put them in your ears and they connect instantly .And automatically turn off and charge when put back in the case. ★【Comfortable to wear & IPX7 deepest waterproof】Do our best to suit everyone's auricle after scanned hundreds of auricle simples to more comfortable to wear . Built with IPX7 deepest waterproof design to prevent water ingress. Ideal for sweating it out at the gym or singing in the rain even swimming. ★【After-Sales Guarantee】Our Products have 12 moths Replacement Warranty and 100% Satisfaction Guarantee, If you are not Satisfied with your Purchase for Any Reason, Please Feel Free To Contact Us.